Custom fixtures for Taphouse 23, PA. Balongue Design. Debra Heschl Photography. 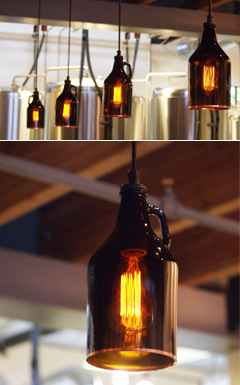 Custom fixtures for the Ale House on Winslow next door to the Bainbridge Island Museum of Art. Please click here for more detail photographs. 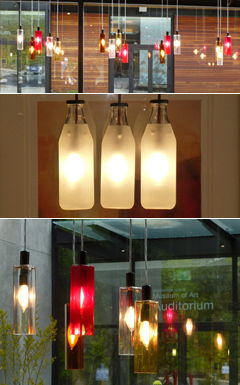 Custom fixtures for a Bainbridge Island bakery and cafe on the plaza of the Bainbridge Island Museum of Art. Please click here for more detail photographs. 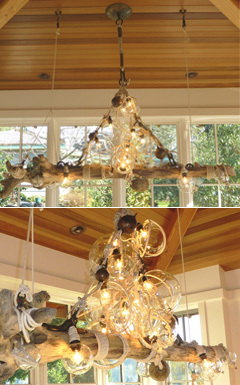 Custom dining room fixture inspired by the home's waterfront location featuing driftwood, rope and antique marine hardware. Please click here for more detail photographs. Bainbridge Island Art Musuem pendant lighting at 8" diameter by 30" OH. 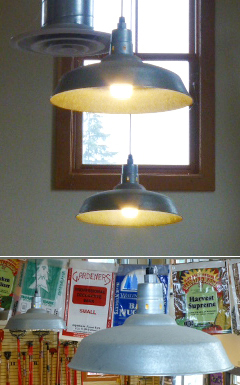 Custom Pendants for Bay Hay and Feed on Bainbridge Island. Pendants are 20” in diameter but we have the tooling for much larger if required. Short Lead Time. Bainbridge Island custom kitchen. 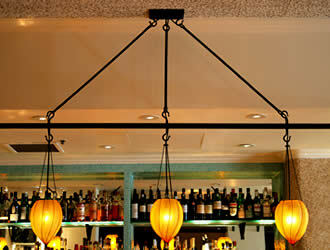 These lights are 12 feet and were made to length in our shop and delivered assembled for quick and easy installation. 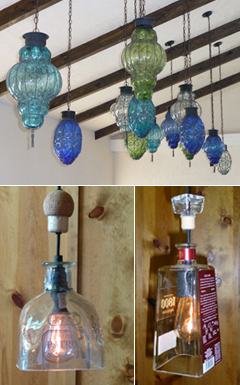 An assortment of pendant lights for Puerto Vallarta Restaurant in Kingston, Washington including caged colored glass and custom-made pendants from tequila bottles. Puerto Vallarta Restaurant, Kingston, WA. 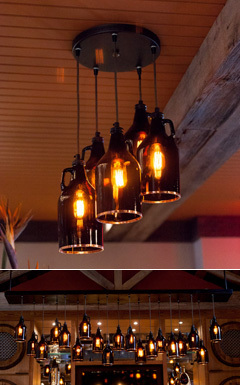 Bainbridge Island Brewery custom suspension lighting created from authentic beer growlers for their Bainbridge Island, WA tap house. Pendant as made for a corporate client. Cube 24 is a 24"x24"x24" pendant. We used Knoll Textile's Allure Meditation and laminated it to a heavy mil styrene. 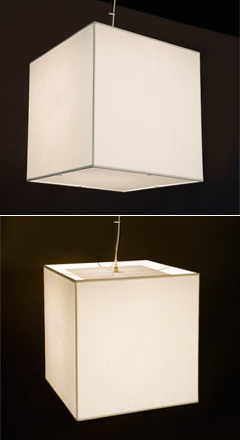 Lamping can vary from (3) incandescent bulbs (75 Watt) to flourescent (PL 13, 18, 26) to LEDs. 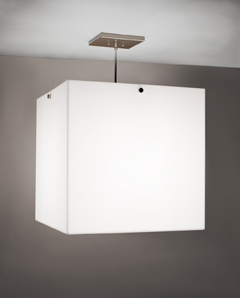 24 Cube is a 24"x24"x24" pendant made from satin white acrylic. The light source is (4) t05 twin tube lamps, Biax 36/39 Watts.Lamping can vary from (3) incandescent bulbs (75 Watt) to flourescent (PL 13, 18, 26) to LEDs. VanLumen Custom Lighting for Restaurants. We worked with a New York Architectural firm to perfect these custom suspension and wall lights for the RN74 restaurant at 31 Mission Street in San Francisco. We are proud of the results, the shades of amber glass on some of the fixtures and the transparency of lampshade material suspended inside blackened steel forms on other fixtures. 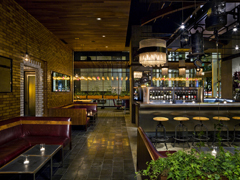 Interior of RN74 Restaurant in San Francisco's Mission District. 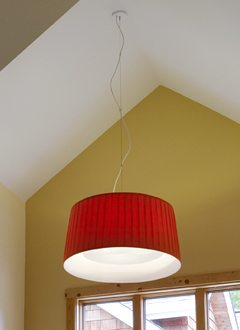 Aurora Pendants with Cherry Laminate. 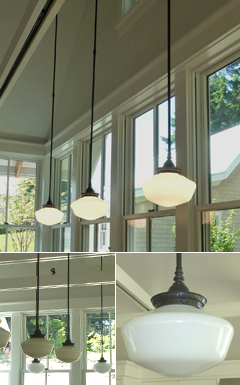 We worked with a lighting designer, architect, and lighting distributor to design these wonderful fixtures using real Cherry wood laminate and dimmable fluorescent light source. 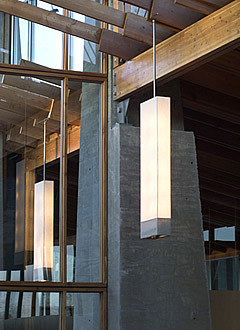 Designed for a city's Council Chambers, 31 fixtures total in 3 sizes, the Aurora fixtures provide wonderful mood or accent light when dimmed and functional lighting when fully lit. These fixtures will be available with a choice of wood laminates or fabric. Three sizes: 25.5"; 31"; 39.9". Pendant groupings filmed at a more recent placement: a school. 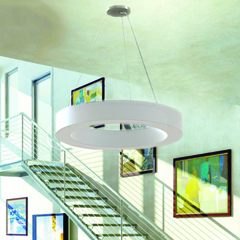 Blakely Pendants. VanLumen designed and fabricated twenty of the fixtures for a public library in Indiana. The design called for two sizes - one 30" in diameter and the other 36". 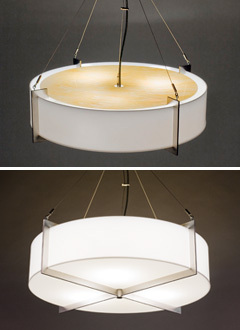 They are fabricated from satin stainless steel, white acrylic and honey onyx acrylic. Lamping is (3) 26 Watt CFL. a setting in which the interior and exterior are almost one. Their lighting fixtures are designed to emulate the architecture--simple, straight lines, unencumbered by excessive detail. VanLumen Architectural Lighting fabricated the architects’ designs to aesthetically allow continuous light to flow over the fixtures' 4 foot length, while also creating a practical space in the bottom to house the church's sound system. The fixtures artfully reflect the architecture, while quality sound flows mysteriously into the interior spaces of the structure. 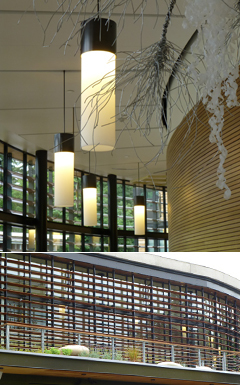 Custom Suspension Lighting from NBBJ Architects for The Bravern mixed use development in Bellevue, WA. 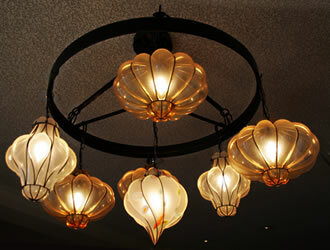 Largest fixtures are 48" in diameter with custom fabric and crystal beads, top and bottom diffusers. The interior of The Shops at the Bravern . 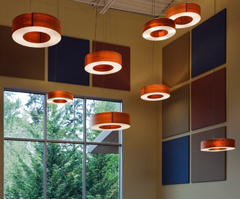 VanLumen fabricates suspension lights in all sizes, shapes, and fabrics. This custom pendant is made of gathered orange linen with a soft white linen lining. 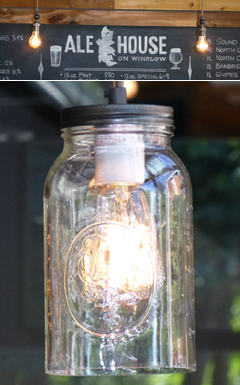 Its diameter is 36" and it was fabricated for a Bainbridge Island home. We have also made similar lights for the GAP stores and for other commercial applications such as hotels, restaurants, and wine bars. The interior of home on Bainbridge Island, WA. 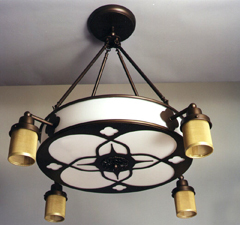 This fixture was designed and fabricated for the Hotel Burnham in Chicago. Situated in the Reliance Building, a National Historic Landmark Building built in 1895, this is a Kimpton Hotel at its finest. It is pet friendly, eco friendly, and a vibrant example of the past, present, and future of Chicago. We are proud to have been a part of its design and evolution. Pendant for Hotel Burnham in Chicago. 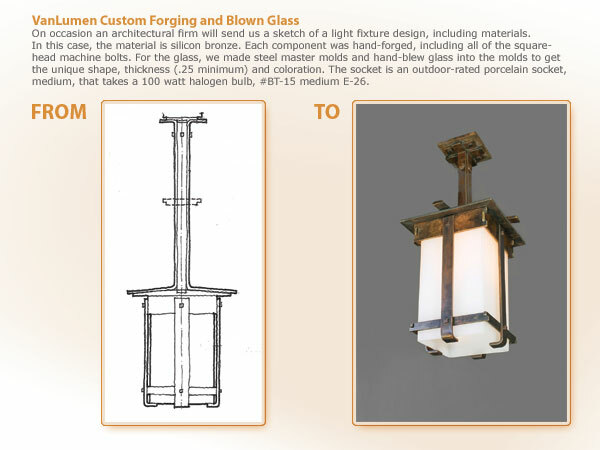 VanLumen took the lighting concept--conceived by a lighting designer emphasizing a combination of Italian glass and American-forged iron--from the design stage to the unique glass and iron creation that you see here. We are experienced in fabricating with wood, forged steel, stainless steel, glass, and fabrics. The interior of Tonno Rosso By Faz Restaurant in San Francisco. The linear beauty of this fixture complements the multi-colored bottles behind the restaurant's bar. Designed again with blown glass and forged steel in mind, VanLumen guided the artists during the forging stage to guarantee that the finished product would fit the site and display the wonderful Italian glass suspended from the forged frame. 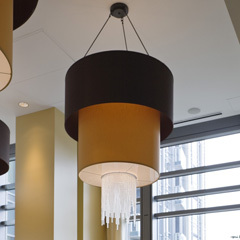 We have created custom suspension fixtures for hotels, churches, and lobbies in condominiums and business centers.